I hiked Lost Peak (Peak 6460) on the east side of Zion NP. Once again, I failed to reach the summit. I think I'm missing some detail about the route. I got further up this time, but stopped at a 12 foot wall. The only way I could see around it required stepping around the wall to the right onto a very steep slab. That path would be rated class 4, since if you slipped and fell, you'd die. The puzzle is ... 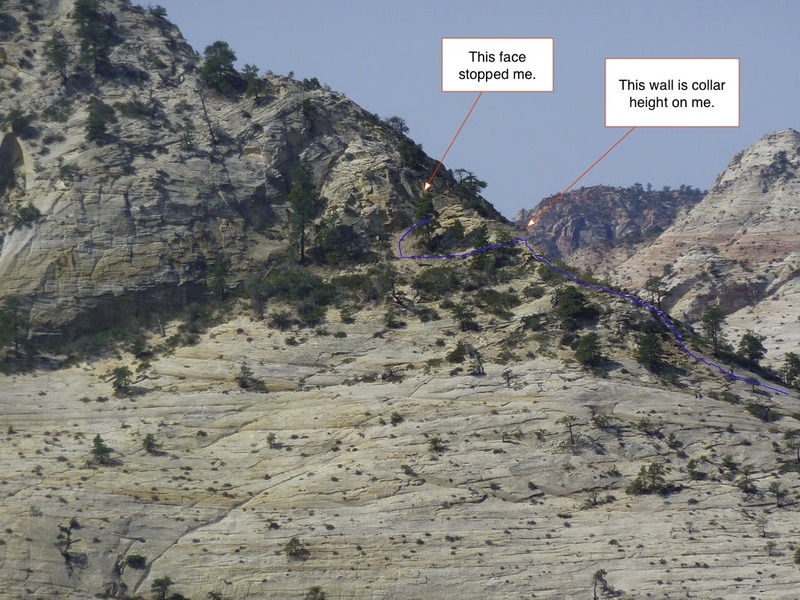 I've seen reports by others that the north ridge route is no more than class 2. And so, I think I'm missing something here. Even Courtney Purcell reports it as class 2 in his book: "Zion National Park: Summit Routes." This photo shows the east side of Lost Peak (taken from Nippletop). The blue line shows my route. This photo shows the section on the north ridge where I got stuck. Please post a comment if you know where I went wrong. Then I walked around the west side of the hill to the south side. I wanted to try the steep slickrock slope up the SE ridge. I almost attempted the SW face. It looked doable as I walked below it. Instead, I continued to what I thought was the base of the SE ridge. I later concluded that it wasn't. I left my backpack at the base and started up the ridge. It got very steep very fast. 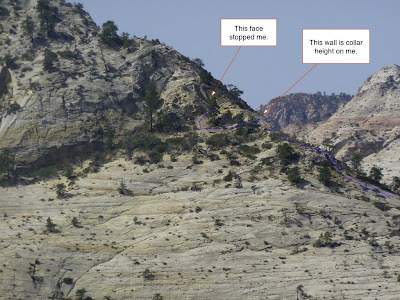 I knew from examining the topo maps and GE that the steepest section is the bottom 80 feet or so. I hike alone a lot, so I tend to be a bit cautious. Having said that, I still get caught going up things I can't get down safely. About half way up the steep section, I decided to see if I can safely downclimb. If I can, then It'd be easy and quick to return and continue up the hill. Well, I was glad to be wearing heavy-duty work gloves because I had to crab-walk down the hill. LOL Once down, I tried another route. The same thing happened. This photo looks up the ridge I was trying. If I were with others, I'd probably be easily pressured to go on up the hill. 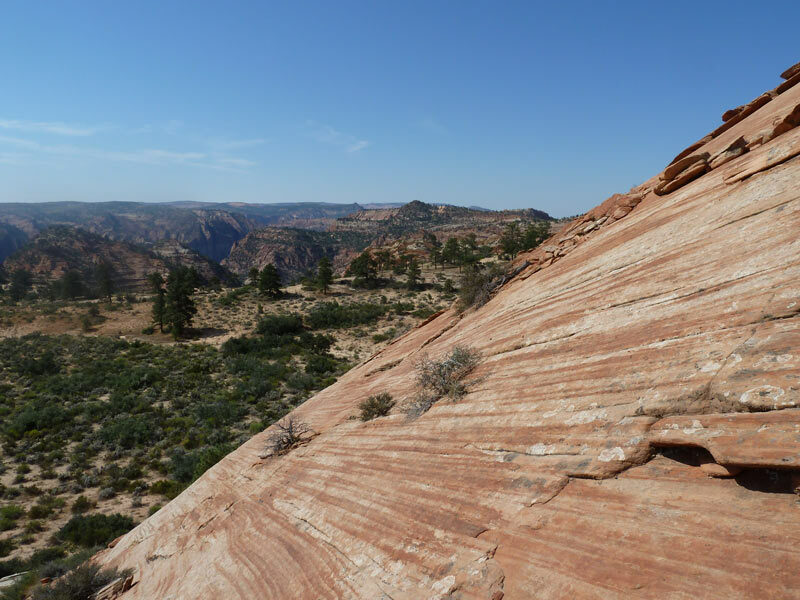 But I was getting tired after having already hiked the north ridge and then around the west side. So I gave up. 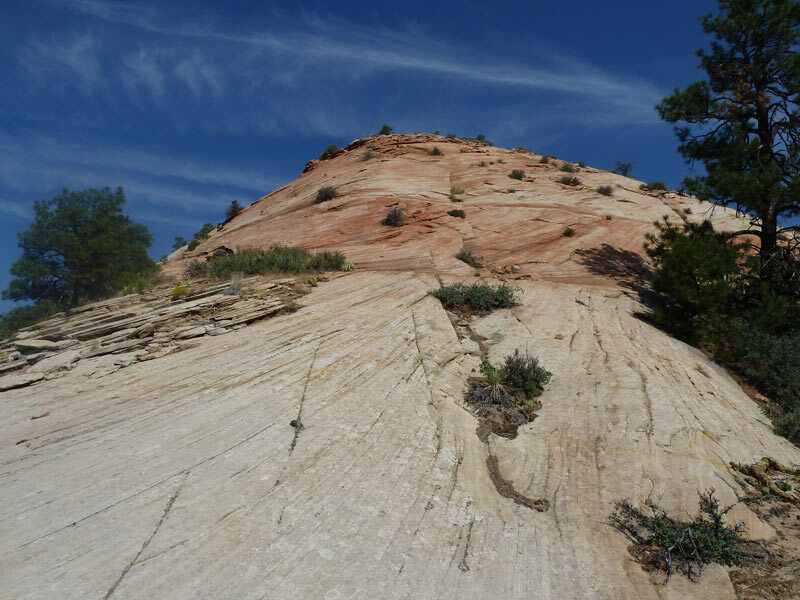 This photo shows the steepness of the sandstone. 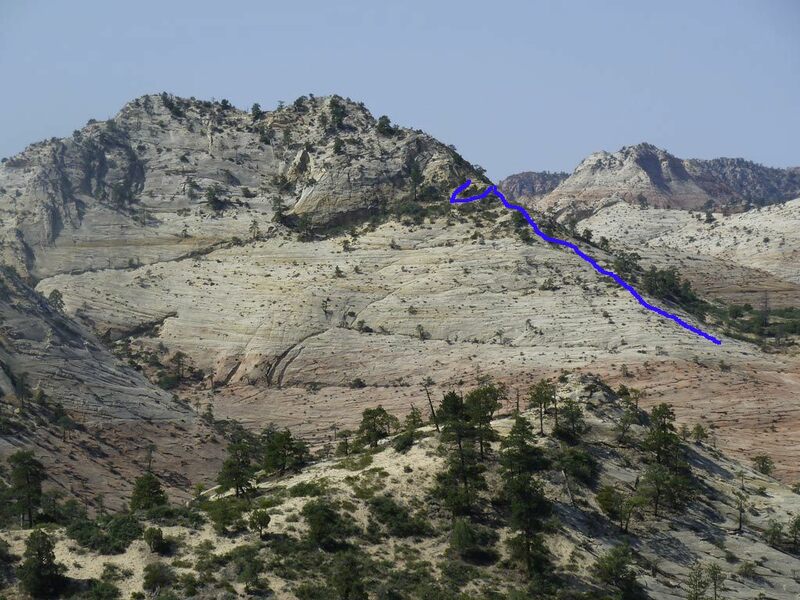 About 5 minutes later, from the saddle to the east of Lost Peak, I saw what looked like a better ridge. I don't think it was the one I just abandoned. That's probably the correct ridge. It's more on the SE and less on the S side. Oh well. Even though I failed to summit, I had a great time. 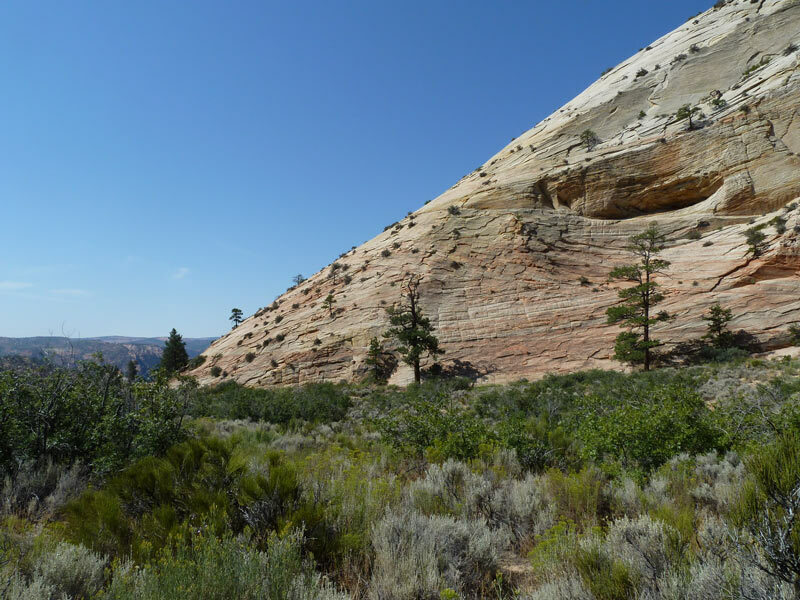 Hiking around the backcountry of Zion is fun. It wasn't very hot. It might have been in the low 80s. The sky was clear with almost no breeze. A great morning to be walking around in the wilderness. 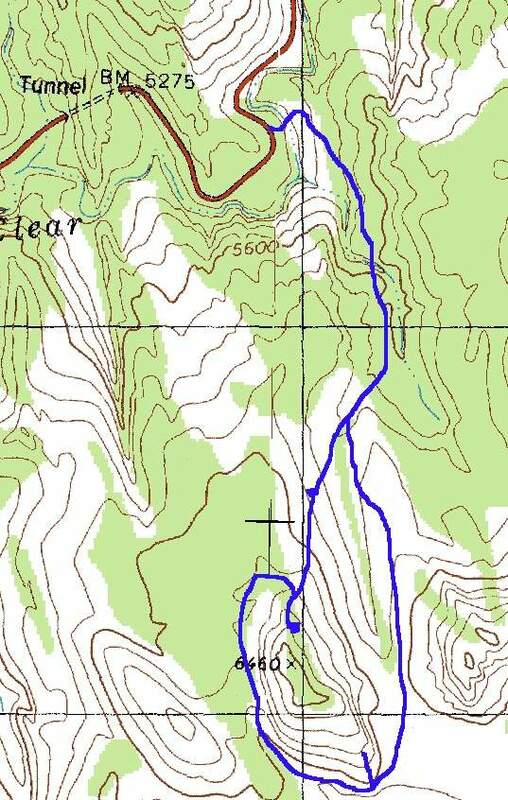 Here's a google map centered on Lost Peak. 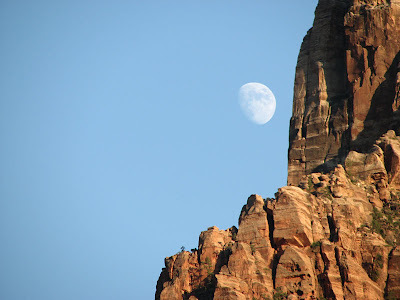 Here's a gratuitous photo of the moon before it hid behind The Watchman. I took this from my hotel room balcony at the Cliffrose Lodge. That's my current favorite hotel in Springdale, Utah.